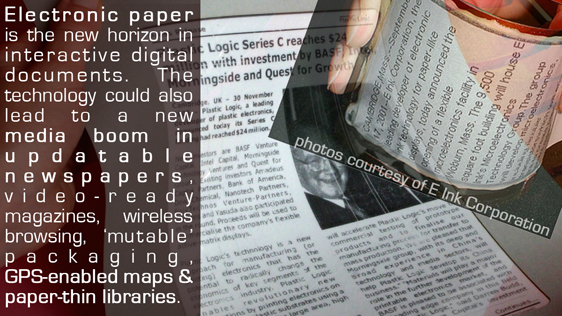 What is happening right now in the investigation of e-paper technology, at MIT especially, is promising in the extreme, warranting enthusiasm about great leaps in speed and ease of use, as computing circuitry advances to make the tactile e-paper device more like a fully-functional touchscreen. What looks and feels a lot like paper and will produce ultra-sharp black-and-white text displays, will also be able to produce high-quality color and a mutable graphic-user-interface that allows for typing, searching, scrolling and all sorts of more agile file-search and manipulation. One-touch downloading and nearly full-sized qwerty-keyboard interaction will make the page-perfect tablet into a replacement for today’s netbooks. UPDATE: Wednesday, January 27, 2010—Today, Apple unveiled its iPad. The iPad is a brilliant expression of some of the features we anticipate for the Page-Perfect e-Reader. It packs an incredible amount of computing power into a thin body, behind a high-quality touchscreen. But there is more to come. We anticipate the iPad will get thinner and lighter over the next few generations, and that within a decade, the quality of full-color touch-sensitive e-paper technology will make it possible to achieve a similar level of computational power to what the iPad now represents in a device that is “barely there”, thin and flexible like paper, though not yet thin enough to be as ephemeral as a sheet of paper. A new rivalry is emerging, between the lightweight reader-attuned Kindle and the high-powered computation-oriented iPad—two very different devices, which at some point will converge into something more ubiquitous, useful, and gentle (in terms of resource-use, impact on readers’ eyes, and power-consumption). UPDATE: Monday, April 6, 2015—The new Apple Macbook is another major leap forward in the ephemeralization of mobile computing technology. First of all, it is significantly more compact and resource efficient than even the previous generation of MacBook Air. The logic board is now a powerfully integrated storage and computation landscape fully 2/3 smaller than the previous record set by Apple. By shrinking the size of the logic board, Apple makes room for a lot of new capabilities, not least a more daring and efficient use of space. But as the need for space scales down, so do the capabilities of the device to take on new forms scale up. The Retina display is now so thin, it is conceivable that within a decade, we will have Retina-quality flexible touchscreen devices. Breakthroughs in molecular computing, rare earth mineral technologies, 3-D printing, and advanced touch-sensitive full-color electronic ink, are making it possible to see a path to flexible, touch-sensitive, ultra-thin computing devices.